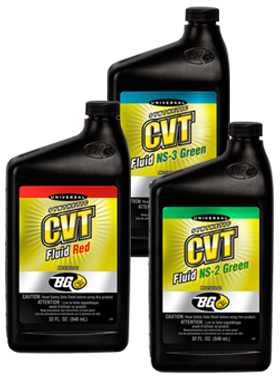 BG introduces CVT fluid that match Nissan and Honda CVT colors – BG Products, Inc.
WICHITA, Kan.–January 12, 2016 – BG Products, Inc., introduces three new colors of continuously variable transmission (CVT) fluid to match popular automaker branded fluid colors. For more information on BG Universal Synthetic CVT Fluid as well as the complete line of BG products, go to the Catalog. To find a shop that performs the BG Transmission Service with this fluid, go to bgfindashop.com.